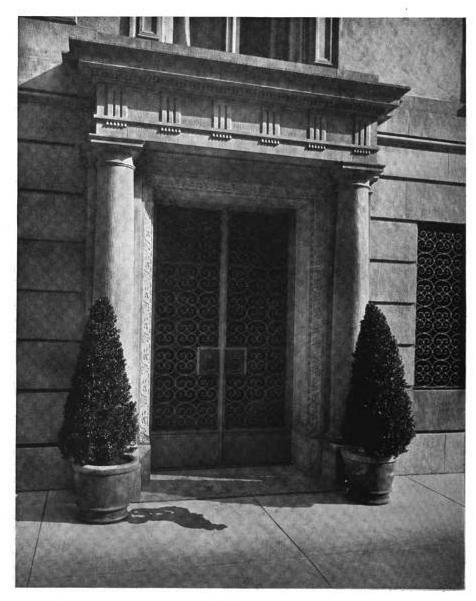 The Bayard Dominick Jr. residence designed by William F. Dominick c. 1920 at 117 East 54th Street in New York City. Dominick's father, Bayard Sr., was a founder of the stock brokerage firm of Dominick & Dominick. 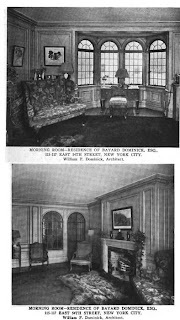 Bayard Jr. followed his father's footsteps in the firm. 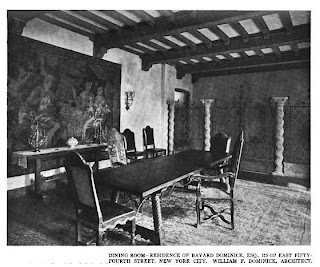 William Francis Dominick, architect of the residence, was either a brother or cousin of Bayard Dominick Jr., and practiced in Greenwich, Conn. Click HERE to see the Bayard Dominick Jr. residence on google street view. 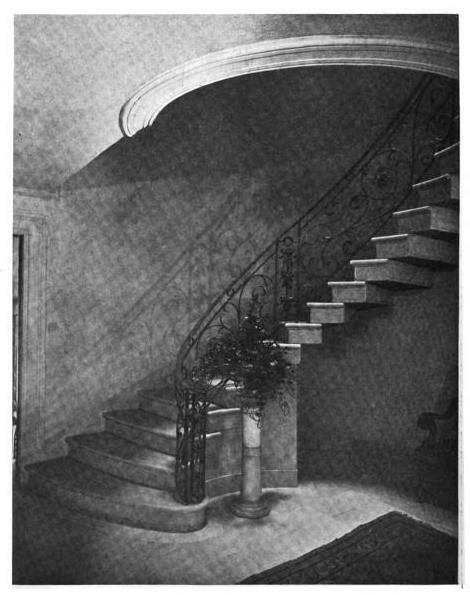 Photos from Architectural Record, 1921. Of all the magnificent demolished townhomes featured to date, this place would unfortunately be the one to have avoided the wrecking ball. Fate is cruel. That dark dank staircase appears to be heading up to a black hole and the trophy room seems too small for the 200 or so mounted heads. 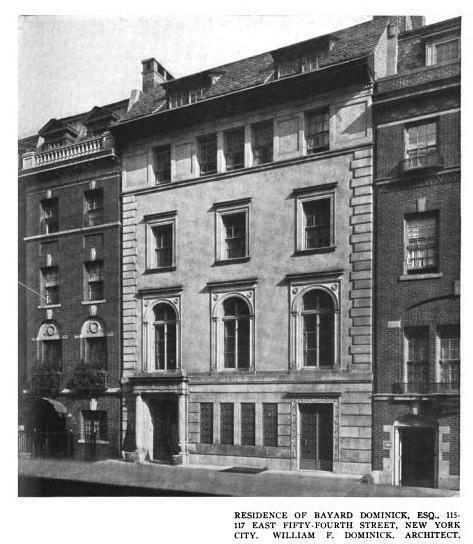 The building now appears to be part of a very dull cluster of surviving NYC townhouses on a very bland Manhattan block. 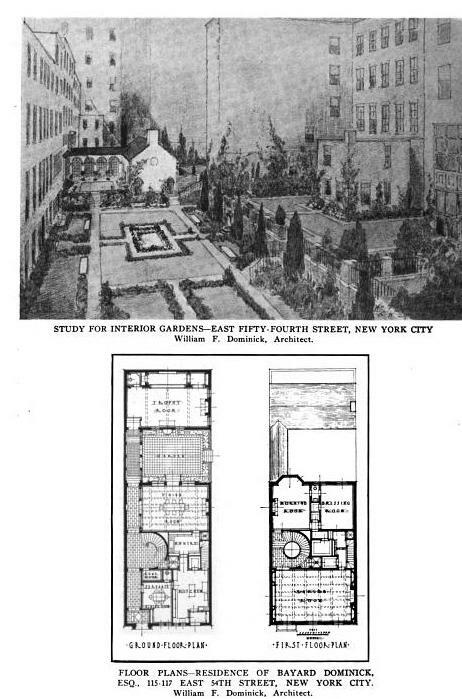 The best part, if ever built, seems to be the pre-turtle bay idea of a common garden shared by multiple homes. Off topic ~ an additional comment on yesterday's posting, "Bellefontaine", has been added. the Battle of White Plains, and Commissary under Washington throughout the entire war. would that I were as innocent as thou." sons of the late W. F. Dominick, George Francis Bayard and the late Mr. William Gayer Dominick. name appears on the Founders' Monument at Hartford, and of Richard Gardner, of Nantucket. 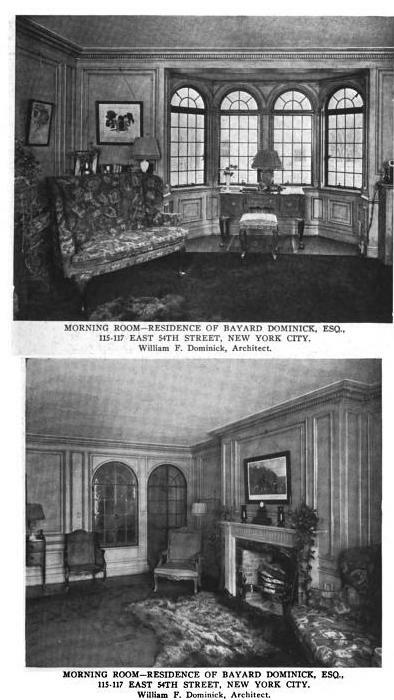 B. Dickerman, the firm of Dominick & Dickerman, to which his brother, Bayard, was admitted. of the Society of Colonial Wars, of the War of 18 12, the Aztec Society, and the Historical Society. the picture by Schraeder, Queen Elizabeth Signing the Death Warrant of Mary Stuart. 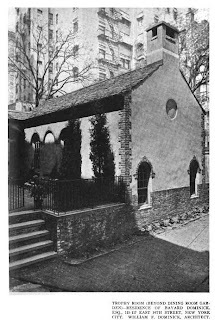 settled in Virginia in 1624, died in New York 1704, and is buried in Trinity churchyard. Mrs.
beloved by all who came in contact with him." 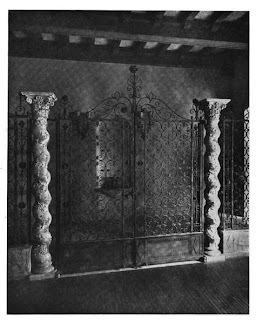 The Dominick coat of arms was granted in 1720. 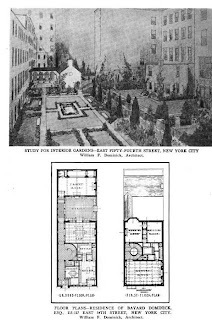 Bayard Sr.'s obituary indicates that the architect was not a son (or brother to Jr.). Whatsa matter Archi, not enough carved stonework for ya? Not enough marble inside? Quick, somebody call PETA---that trophy room is scary (But a nice room under all the dead heads). Very surprising house inside---I like the wing and court. Ditto on the wing, court and trophy room. 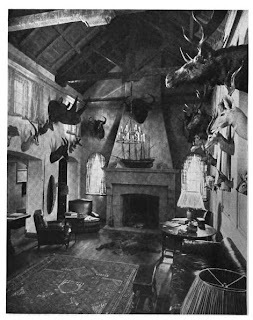 I don't know how many houses I looked at -- here and at OLI -- with tiger-skin rugs before I realized that there must have been someone selling them in NYC. Because there's just no way that some of these people were in India hunting tigers. Well aside from the great trophy collection, nice garden court and narrow tacked on superfluous mini wing, we have yet another entire day at Beyond the Gilded Age to view this dreary, boring box of a townhouse. I think we need some architect to add a little carved stonework to liven up the box. Thanks so much for posting this --the architect and the owner of this home are both relatives of my mother's Aunt Gertrude Schweppe Dominick. Many, many thanks for posting this! Both the architect and the owner of this home are relatives of my mother's Aunt Gertrude Schweppe Dominick. I am working on figuring out the relationship between the architect Wm F. Dominick and Bayard Dominick Jr. I do, however, know that Bayard Dominick Jr was my great Uncle Everett Dominick's brother.